Maybe you’r not a proteg’e but a parasite. A parasite wants what you’ve earned not what you’ve learned. A parasite wants whats in your hands not what’s in your heart. Are you a protege’ or a parasite? 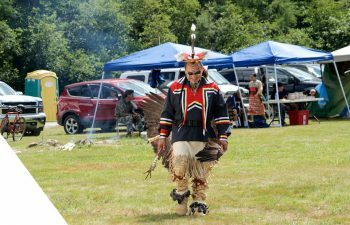 Jim Maloney, ‘War Chief’ to The Mi’kmaq Nation, The Mi’kmaq are the original natives of Nova Scotia, New Brunswick, Newfounland, Quebec and Maine. To get Jimmy going when he was sparring, Bob Bethoney would pound out an Indian war drum beat on the floor louder and louder. It was as if to call the Indian Chiefs’ spirits to come down and join Jim’s body. After that jimmy was fighting like a God. When you look at the last scene in the movie THE LAST OF THE MOHICANS, where the father having seen his son killed, rushes up the mountain slaying dozens of Indians without breaking his stride and with the eye of the tiger in Mooshin , finally gets to the person who killed his son and is able to take revenge with violence of action, power and technique…….that is Jimmy. 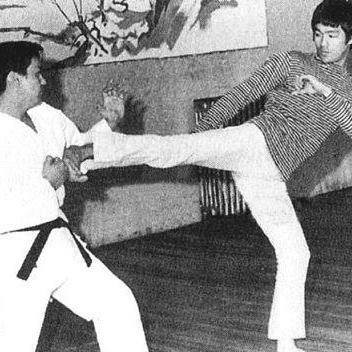 Bruce Lee visited George Mattsons’ Dojo once and Jim sparred Bruce; in fact there is a picture in Bruce Lee’s book with Jimmy and Bruce squaring off. Maloney’s fighting speed in those days was phenomenal. Bruce had a hard time against Jim who would charge him behind a wauke sweeping away his kicks. In this shot you can see Bruce Lee about to be taken down by Maloney. Uechi Ryu has the ‘straight blast’ similar to Wing Chung but with open chain palms out of Seisan that are extremely effective for short stop and take downs. Bruce wasn’t used to that. 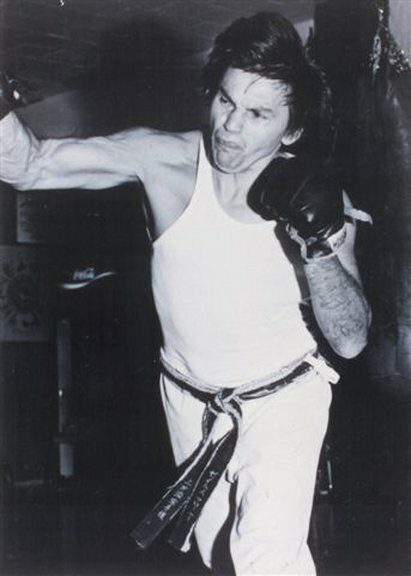 In a conversation with Van Canna, Jimmy said that the exchanges were many and Bruce used some of the action shots for his book..
Van said, Bruce was unable to close the distance with his fast kicks.and that Jimmy had to take it easy on him because he weighed only 127 pounds. George Mattson was telling Jimmy ‘Take it easy’ for fear he’d knock him to the floor. Jimmy did confirm he got his wauke under his side and round kicks several time in a jamming fashion, off balancing him, but holding him up so he wouldn’t fall. I remember as a 14 year old kid going to Jimmy’s seminars on (P.C.T. ).His Pressure Point Control Tactics seminars are ‘electrifying’ to say the least !!! At 15 years old I returned to George Mattson’s Summerfest and demonstrated the skills he had taught me the year before. Sensei Maloney awarded me a beautiful certificate from the tribal justice institute, it became my prize possession. Disenchanted with the politics involved in the testing process in Uechi Ryu, I hadn’t tested in 10 or more years. 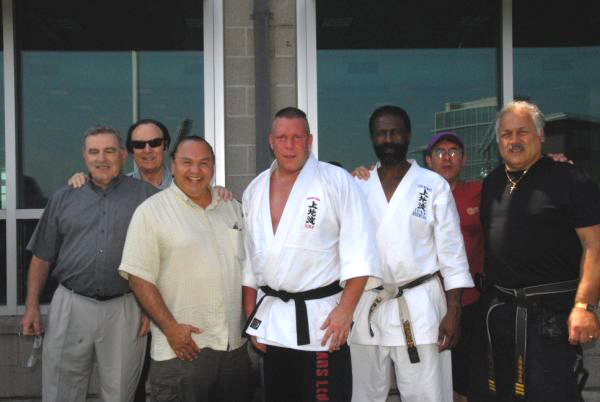 I had a discussion with Sensei Maloney about Rank and Titles and to my surprise he asked me to look at my skills the next day. The Gi tore at my sunburned skin as I performed the test material on a wet incline of grass at the Massachusetts Maritime Academy. One of my highest honors was my test board, it consisted of a host of legendary fighter / Grand Masters from Karates’ Blood & Guts era! I was surprised and empowered when these great men actually cheered me on. Don’t look for someone to give you influence only as a mentor. not a channel of influence to societal wealth and power and prestige. His influence should be towards achieving your dream and greatness.